High efficiency central air conditioning from Greeley Furnace installed to factory specifications by highly trained, NCI & NATE-certified technicians can reduce your energy costs and make your home more comfortable! Load calculation is key and will lead to selecting a properly sized unit. This calculation determines the capacity of the equipment needed and the correct distribution of air to each room. The Air Conditioning Contractors of America (ACCA) recommend a Manual J load calculation. An oversized air conditioner doesn’t mean cool comfort for you. It means higher electrical bills and a home that’s not comfortable to be in! An oversized unit short-cycles and uses more electricity than a properly sized unit. Air conditioners operate more efficiently and lower energy bills the longer they run continuously. Paying extra for an air conditioner that’s too big for your house may sound like a good idea at first but the larger system will cost you hundreds of dollars more and give you fewer years of service…costing you more in the long run. The bigger the AC the faster the air rushes through the ducts and grilles and the louder the noise gets as the air tries to force its way through the small openings. Make sure the load calculation for your home fits the unit. Make sure the ductwork is the proper size and well-sealed. Research SEER, how efficient do you want your unit? The standard is 13.00 SEER but if you are concerned about energy usage and the environment you may want to invest in a more efficient product. Look at the noise level and how it will affect your living habits. If you spend a lot of time in summer on your patio near the unit that is a consideration. 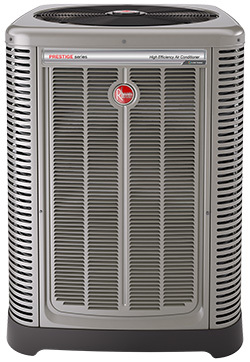 Don’t wait until the first hot spell to think about a new air conditioner. If your unit is more than 10 years old, our certified technicians will give you a pre-season diagnosis. If you wait, you will likely pay more and it could take weeks to schedule installation! 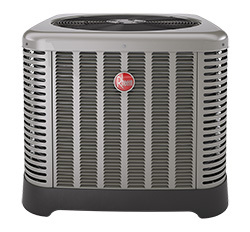 Watch for Rheem and utility company rebates in spring that can save you a lot of money. Our maintenance plans are an excellent way to ensure regular check-ups that prevent repair or safety problems and will help to extend the life of your system. It will also help keep your utility bills down by insuring your system is working at peak performance.